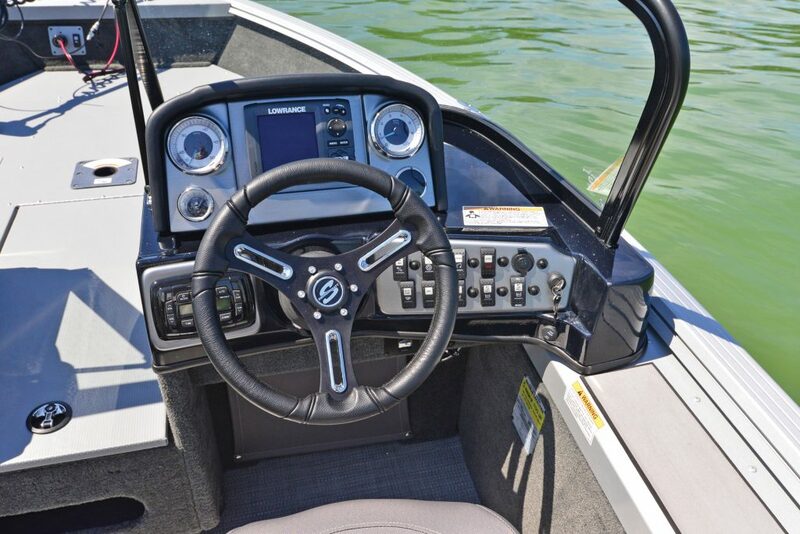 Well protected by the windshield, the control station of the 162 Pro Mag displays a built-in sounder. Smoker Craft’s continued commitment to product enhancement is evident in its all-new 2017 Pro Mag lineup. 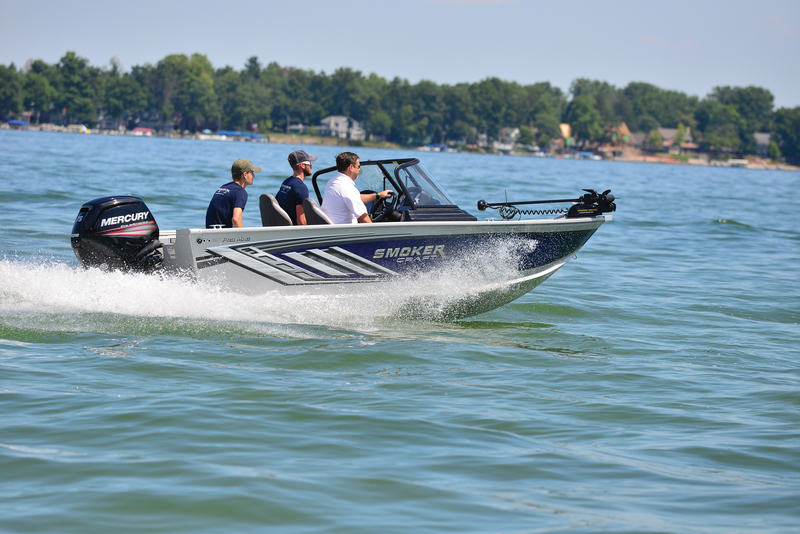 Featuring 16, 17 and 18-foot models in either single or dual console versions Pro Mag throne at the top of the vast family of Smoker Craft fishing boats. 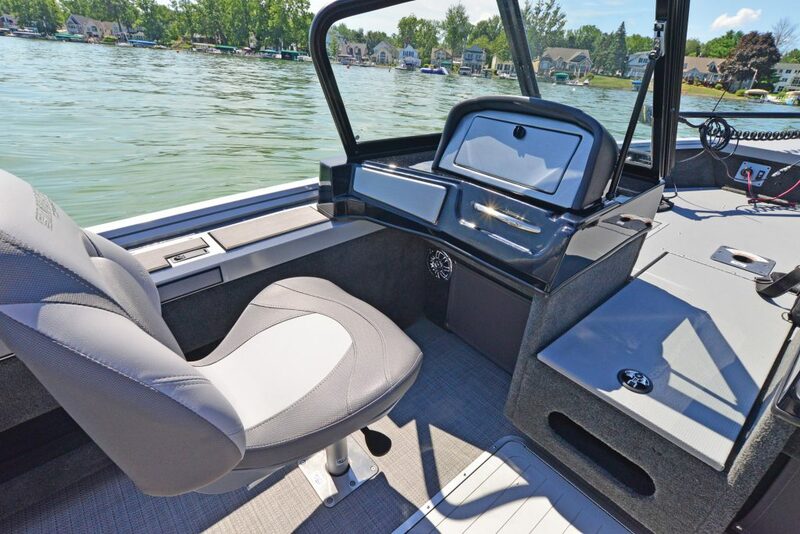 In Canada, the 162 dual-console model is sure to be a hit with its 16-foot hull and articulated center section full-windshield, which offers increased comfort and enjoyment early or late in the navigation season. When viewed at the end of the wharf, the 162 Pro Mag resembles most 16-foot aluminum fishing boats with its large, raised front fishing platform, well-proportioned cockpit and second raised fishing platform. ‘back. 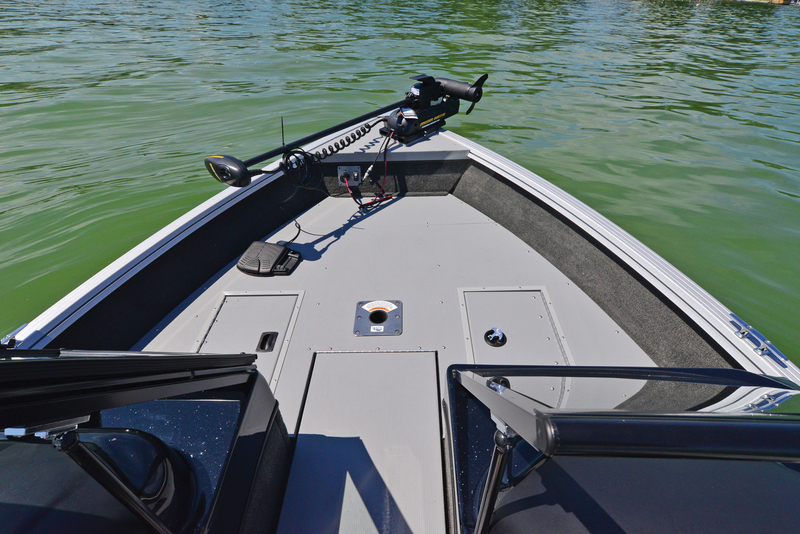 But when you take a closer look, you soon realize that the Pro Mag 162 is much more than a basic fishing boat. 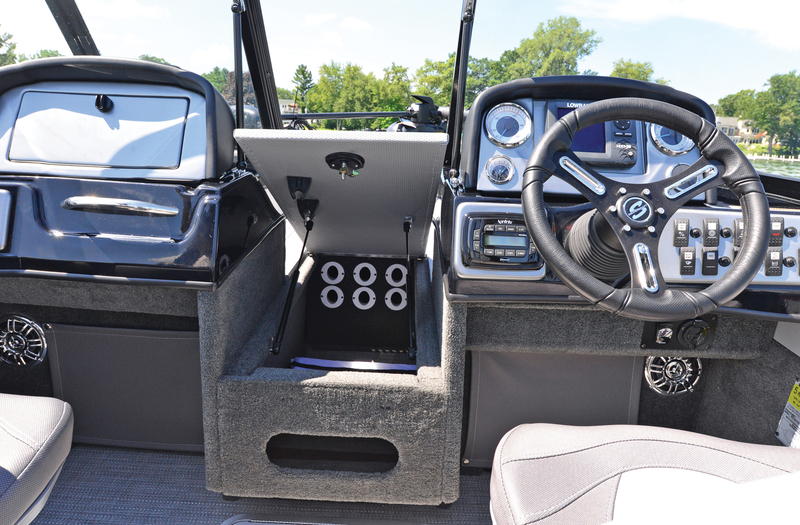 Covered with vinyl and easy to clean, the front fishing platform hides a pool on the left and a storage on the right. A difference that is noticed almost immediately is the soft vinyl coating of the front fishing platform. More durable, drying faster and easier to clean than the usual carpet, this coating highlights the careful approach of Pro Mag. There is a mounting plate for the electric trolling motor and a control panel with 24-volt plug and switch for tilting the main motor. The floor hides a 56.7 liter ventilated livewell and ample storage. There is also a receptacle Swivel-Eze aluminum for a removable fishing seat. What seems less is that the platform is just at the right height to practice the light throw and fight and recover a fish. Just high enough, but not too much. This is the kind of thing an experienced fisherman notices and appreciates. Towards the cockpit, a canister with a lid assisted by two cylinders can swallow six rods in individual tubes. The assisted lid allows you to use both hands to store or retrieve rods, which can be very convenient. There is also another chest in the floor, with tubes for five canes. 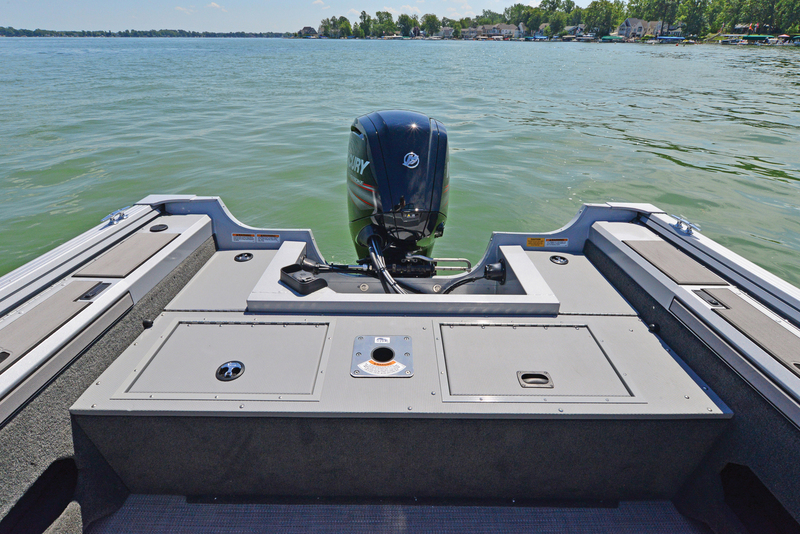 The raised rear fishing platform limits the size of the engine. Our test boat was equipped with the Yarblow ventilation system which circulates fresh air in the canes and storage compartments. storage locker ventilation system. Controlled by a switch on the dashboard, the system allows dry paraphernalia, which is important on a fishing boat since everything ends up being wet. In addition to preventing the formation of rust, the Yarblow system eliminates the usual mold smells that fishermen know too well. The floor covering of our cockpit was practically vinyl Sea Weave, but a removable carpet is offered as an option if desired. Personally, we prefer the Sea Weeve. Its textured surface is slip-resistant, easy to clean and is soft and comfortable underfoot. Le nouveau système de ventilation Yarblow fait circuler de l’air sec qui permet d’assécher les rangements et leur contenu. 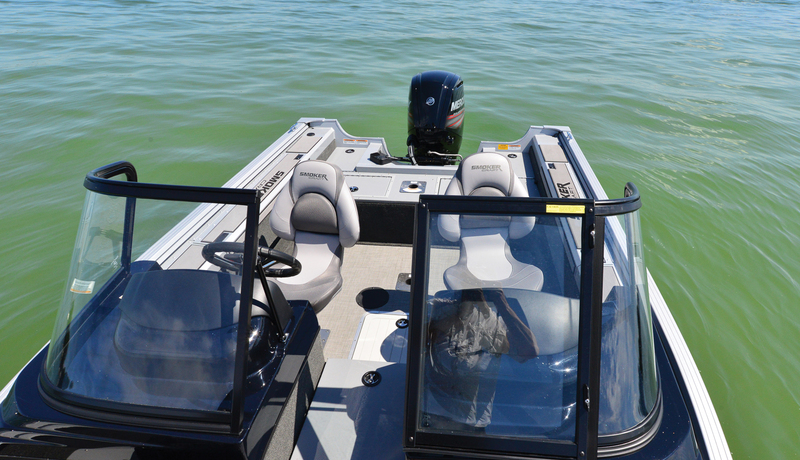 The large black-curved windshield protects passengers very well when the weather is cool or rainy, a benefit enjoyed by fishermen early or late in the season. Even if it’s high when viewed from the cockpit, the windshield is at a comfortable level when you launch from the front platform. This is not always the case on competition boats. 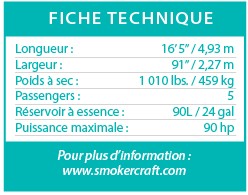 This is another clue that suggests that Smoker Craft designers are fishermen who listen to comments from their fishery customers. Both consoles are molded in fiberglass and look great. That of the passenger has a solid handle to grab when it brews, a glove compartment and a large storage in its base. The captain’s has an elegant, easy-to-read dashboard. Our test boat had a Lowrance Hook 5 recessed sounder right in the center, but you can order a Lowrance Elite Ti, HDS-7 or HDS-7 LSS if you want more. Humminbird units up to the Helix 9 DI model are also available. The basic audio system is an excellent Infinity PRV250, which optional can be replaced by a PRV350 connected Sirius. The 162 Pro Mag comes with two top-of-the-line removable fishing seats with pinch-free hinges to protect both your fingers and the tip of your favorite rod. The captain’s seat adds a zipper fit as in a car. In all, there are six bases distributed on the boat, which allows you to install the seats where they are needed. The gunwales are particularly interesting. In addition to the top-accessible canes on each side, the 162 Pro Mag is equipped with the Integrated Track System which allows for easy installation of various accessories such as rod holders or downrigers . It’s super convenient, to the point that you will quickly wonder how you could do without it before. We also note the presence of an interior lighting that gently bathes the perimeter of the boat with a soft blue glow. The glow does not affect your night vision but makes it much easier when fishing after dark. It’s not bad for a romantic trip under the stars too. 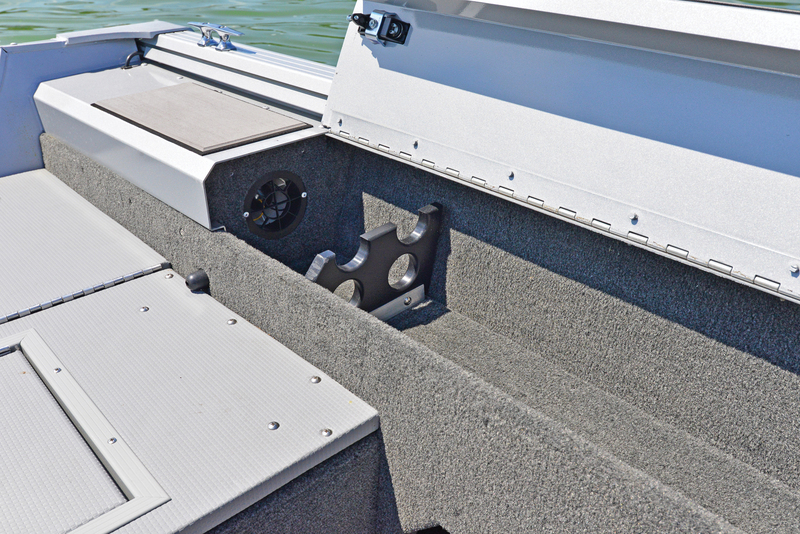 The rear elevated fishing platform hides a voluminous 94.6 liter aerated livewell. 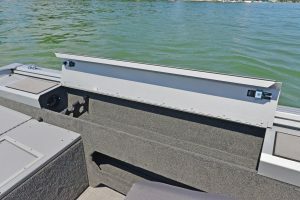 A ledge around the motor well adds a safety feature when fishing on this platform. There are other storage spaces in the floor for fishing tackle and other stuff. The total storage volume is rather impressive for a boat that is only 16 feet long. Although the maximum power allowed for this boat is 90 horsepower, our test model was equipped with a 75hp Mercury four-stroke outboard. Smoker Craft’s Hydra-Lift hull has a reputation for performing well with a lower-power engine, and our test has clearly shown that this reputation is not overrated. On a hot and humid afternoon in August (yes, there were such days last summer …), we took off with a tank of gas and three big guys aboard. The Pro Mag did not disappoint and easily sailed, without raising the bow excessively and allowing the captain to see well ahead. True to its name, the Hydra-Lift hull lifts quickly, creating an increased air flow in the cockpit, which was highly appreciated by our three lads on this hot and humid day. With the trim at zero, the time to dive was on average three seconds stack. By tightening the trim to the maximum, the time for seaming improved by a fraction of a second. It was however the top speed that really impressed us. At full throttle, we noted a speed of 47 mph on the GPS, which is really fast for a boat of this size and heavily loaded on a hot and humid day. In fact, it’s fast for a 16 foot regardless of the conditions. With less load and maximum power (90 horsepower), the 162 Pro Mag will have no trouble getting past 50 mph. The buyer of such a baterau does not look for a sport boat, but the fact remains that during a fishing tournament, being able to move quickly from one place to another is often very important. In normal use, the Hydra-Lift hull is distinguished more by the homogeneity of its behavior and agility than by its speed. The 162 is really efficient and even fun to drive. It goes where you want to go without fuss, with great precision and stability. He laughs at the choppiness and wake of other boats, keeps his course firmly with his five-pin design and sparingly consumes gasoline, especially with a 75 horsepower behind. With the 90-liter tank, you can get to the end of the chain of lakes, troll for hours and return with your catches without tickling the bottom of the tank. In absolute terms, the 162 Pro Mag remains a small boat but for the average angler, it is spacious, efficient and versatile, as comfortable to participate in a fishing tournament as to tow the children on a boat. swollen bidule. Made with care and superbly equipped, the 162 Pro Mag offers excellent value.